Photopolymerization, particularly in crosslinked systems, proceeds via a complex reaction-diffusion process. Initiation, propagation (including those leading to crosslinking), and fluctuation are controlled by the concentration of monomers and initiators, and their respective rate constants. On the molecular level, these events occur in a stochastic manner. 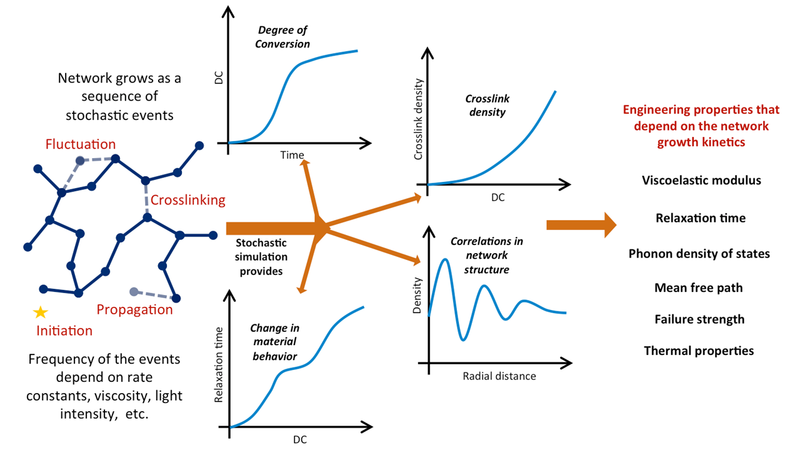 Competition among initiation, propagation, and fluctuation affects the extent of polymerization (degree of conversion, DC) as well as the network structures and properties. We have developed a computational method to simulate the complex interactions of the stochastic processes during polymerization. Specifically, the firing rates of these stochastic events are determined based on monomer information (e.g. functionalities, rate constants, diffusivities, interaction energies). The spatial configuration of the growing nonequilibrated network is also considered. Using this method, we can determine the network structure in terms of spatial heterogeneity, in addition to quantifying the curing kinetics in terms of DC and crosslink density. It is well-known that a host of mechanical, thermal, and energy dissipative properties are related to the spatial structure of polymer networks. Thus, this simulation technique provides a computational map of synthesis → structure → properties, which is essential to design the fabrication protocol required for creating a polymerized material with desired properties. The following animation shows stochastic network growth simulated using our software for a high viscosity resin. Most of the crosslinks (yellow sites) are created at later stages of curing, and each new crosslink replaces a regular network node (red). The spatial distribution in crosslinks and regular network nodes determines the mechanical and thermal properties of the photocured polymer.